When the Reality Check News & Information Desk moved its operations to the mountains of Northwestern New Jersey in the late summer of 2001, there was some trepidation as to the level of local politics it would cover. There had been major fallout in New York from years of underhanded and admittedly vicious attacks, not to mention ill-conceived unabashed mockery from Albany to Gracie Mansion, never mind Westchester contacts that became both rankled and legally vindictive. But the pull of N.J. politics and its tawdry history wet our appetite for shenanigans like never before. When called upon we came with swords sharpened, but usually stayed out of the “regular dealings”. Even now when called by friends and most recently my esteemed attorney to join a fight on school budgets and the teachers’ union, we tend to balk. This is not out from lack of concern or civic duty, but a regrettable deficiently of faith that any type of petition, rally, or endless political meandering could curtail The Machine. And this is what current governor, Chris Christie took ownership of this past January, becoming the first Republican to run this mess in a dozen years. Christie’s aim, stemming from the fervor gripping the entire nation in this The Year of the Faux Revolution, wherein taxes must be cut as entitlements grow or at the very least keep rolling along untouched, was to slash the state’s bloated budget and make the hard choices in cutting into N.J.’s massive deficits. Problem for Christie, as it is across the nation, as recent primaries and soon-to-be mid-term elections portend, is two-fold: As much as the citizenry rails against taxation, it also does not want its stuff taken away, and that’s where Democrats — which run the state’s legislature and will likely (despite national Republican gains this fall) will be running the legislature come 2011. 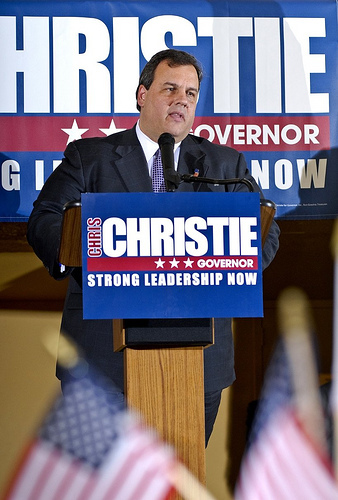 Christie, once a symbol of anti-establishment uprising, has now become The Man. The fickle public has once again seen the sacrificial way of The Budget Cut, and it is not happy. Christie, once a symbol of anti-establishment uprising, has now become The Man. The fickle public has once again seen the sacrificial way of The Budget Cut, and it is not happy. This fuels Democrats to cry, “I told you so” and then to fuel fears of going without while completely ignoring the obvious need to choose between endless government-provided measures, from stop lights to libraries, and lowering an exploding deficit hardly ceased by an expanding tax burden. The backlash against Christie’s proposed school budget cuts and general state-run services has been rabid. Many of the same groups polled, and eventually those who rushed to the voting booths to sweep in an anti-incumbent, anti-big government, tax cutting, fiscally responsible alternative, are now roundly pissed. These are the same socially liberal and fiscally moderate independents, as well as so-called hardline blue dog Democrats and staunchly conservative Republicans who had swung more to the Left than ever before in 2008, and were then roundly pissed at what they believed was a snow job by our current president. Mainly, these people; whoever they are and whatever they represent, do not know what the hell they want. Either that or they are incapable of dealing with the parameters of reality as presented by measuring factoids, like, for instance, simple math. N.J. Democrats, for their part, have been crying “tax cuts for the rich are not fiscally responsible and leave the middle class wanting”, which has a certain comforting if not recidivist ring to it. Ultimately controlling the coffers, and using the tide of “keep your hands off my entitlements and keep my kids in schools and make damn sure cops are patrolling my neighborhood and garbage is picked up weekly” to battle Christie’s hard-swallowing budget proposals has sent us all back to Square One. Hence the recently proposed Millionaires Tax sent to the governor’s desk as this goes to press, which will most assuredly be vetoed by Christie, despite his backtracking on eliminating senior property tax rebates in his current budget plan. Christie, who has been chewing daily on humble reality pie of his own, now sees the silly notion of actually balancing budgets and cutting taxes in a state where there is an expected level of living, which is highly expensive and never fully paid for, but continues to roll along madly. As if finally giving into the delusion of his electorate, Christie claims with the restored benefits, the budget could still be balanced. This kind of talk renders the Christie Experiment in Change as neutered and useless as what has become of the country’s perspective on Barack Obama’s attempt at such a notion. And it will absolutely put the kibosh on the populist rage that swept 47 year-old Rand Paul — a fair Libratarianm but lousy politician — into the national spotlight; another post-Boomer type that ignores the writing on the wall, which reads in bold caps: GOOD LUCK, SUCKER. So let New Jersey’s misfortune in No Solution is Palatable be a lesson to the rest of the nation. Unless someone actually has the balls to raise taxes to pay for more stuff or cut taxes and ignore the public’s hue and cry in getting less stuff, there will be another election between bellowing billboards with fancy ties propped by powerful slogans which will result in the same old song and story.